This recipe is quick, tasty and suitable for family and friends alike. I like to just leave all the components of the meal in the middle of the table and allow guests to help themselves and build their own fajita. 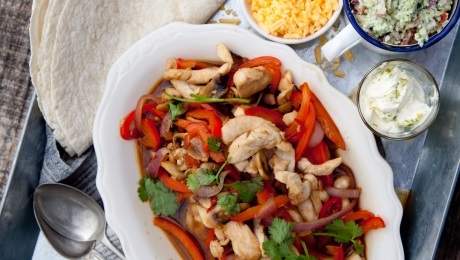 The stir-fry part of this recipe works well with pork, duck or beef. To make crème fraîche spread just mix all the ingredients together until combined. Chill in the fridge until required. To make the guacamole, add all ingredients, except the tomatoes and cream cheese, to a food processor or large mixing bowl and blitz. You can use a hand held blender if desired. Blend until a relatively smooth purée has been achieved. Remove from the blender and mix in the cream cheese and chopped tomatoes. Make sure this product is well chilled. Grate some cheddar cheese and have this standing by also. For the chicken part of the dish, mix the honey, cumin and soy sauce together in a bowl. Set aside. Heat a large saucepan or wok. Have all of the ingredients prepared in advance because you do need to stand over this dish. Add a little oil to the wok together with the chilli, garlic and sliced chicken. Allow the meat to seal off quite quickly. Next add in all of the sliced vegetables into the wok and allow these to cook quickly. Add the honey, cumin and soy sauce mix to the chicken and vegetables when they are almost fully cooked. Correct the seasoning of the dish at this stage bearing in mind that the soy sauce can tend to be quite salty so a lot of salt may not be required. To serve, spread a layer of the crème fraîche onto a warmed tortilla, add some of the chicken and vegetable mix, some guacamole and some grated cheese, wrap and enjoy!